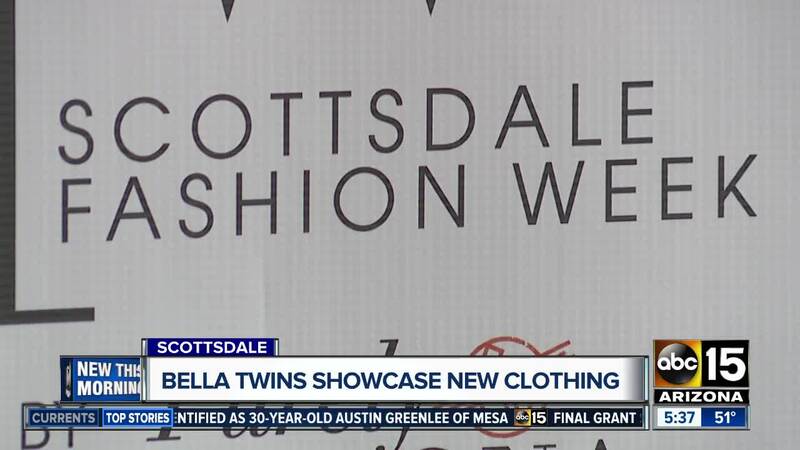 The Bella Twins show off new collection at Scottsdale Fashion Week. SCOTTSDALE — This weekend, Scottsdale is your runway. The city putting on Scottsdale Fashion Week Thursday through Sunday with a variety of events beyond the catwalk and across different venues. "The way we do Scottsdale Fashion Week is yes, it's certainly about the fashion," said Jamie LeVine. "But, it's more than that. We have entertainment elements that really take this to an event stand-point." LeVine has been designing which designers will come to the event and overseeing everything from shows to entertainment and beyond. "You've got a lot of these brands who are showing at New York Fashion Week, who are showing in Milan and Paris," LeVine explained. "And Scottsdale is a beautiful city. We've got a lot of amazing people here and a lot of people who want to come and showcase their brands because it is a destination for people." And LeVine said since fashion is what makes people feel fabulous, she was focused on finding variety to stitch together the fabric of a unique event tailored for everyone. "It's not about the perfect size, it's not about [being] skinny as can be. It's really about how you define fashion and how you wear it and it really caters to anybody," LeVine said. "And I think that's the big thing for people is we want to be stylish, but yet, we want to be comfortable," said Brie Bella while showing off her new collection with her sister, BirdieBee Brand. By meshing comfort and style, the powerhouse professional wrestlers Bella Twins will be showing their new collection at the W Scottsdale Friday night. "It's fun now bringing them into 'athleisure' because you can be just as loud doing your errands, you don't have to save it for a red carpet event," said Nikki Bella as she showed off the neon pops of color in their line. But, while the WWE Superstars have gained national attention in the ring or on their reality show, 'Total Bellas ' on E! Network, the spotlight is shining in a special way Friday in Scottsdale. "We were raised here," said Brie Bella. "So, we were like these little girls who had big dreams, who never thought in a million years that we would be here." The dynamic duo have been breaking barriers in the world of wrestling, but they now say they are bringing body slams into the boardroom to empower other women. "Everyone kind of laughed because they're like, 'Professional wrestlers in fashion?'" Brie Bella said. "And I feel like we're like starting to dominate the fashion world and what is truly who we are is 'athleisure.'" If you want to see the Bella Twins and their BirdieBee designs or any other events, click on this link for tickets for weekend. You can also buy tickets at the door for each event you would like to attend.